I guess the shopping for this project didn’t go all that smoothly, but I found everything in the end. It’s still really early in the holiday season, so the stores weren’t completely stocked for Christmas yet. 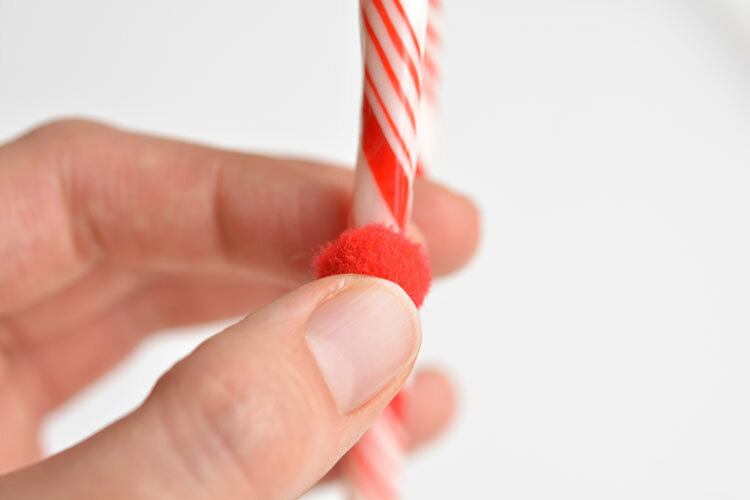 The dollar store didn’t even have candy canes out. All the Christmas boxes were stacked in the aisles but they weren’t unpacked. And as tempted as I was to pull out my keys and rip open the tape on those boxes, I held myself back (it was hard though… I definitely stared at the boxes for at least a minute considering it…). 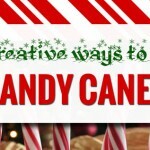 But not to worry, candy canes were the first thing I saw when I walked into Walmart. It was just those darn brown pipe cleaners I had to make an extra trip for. 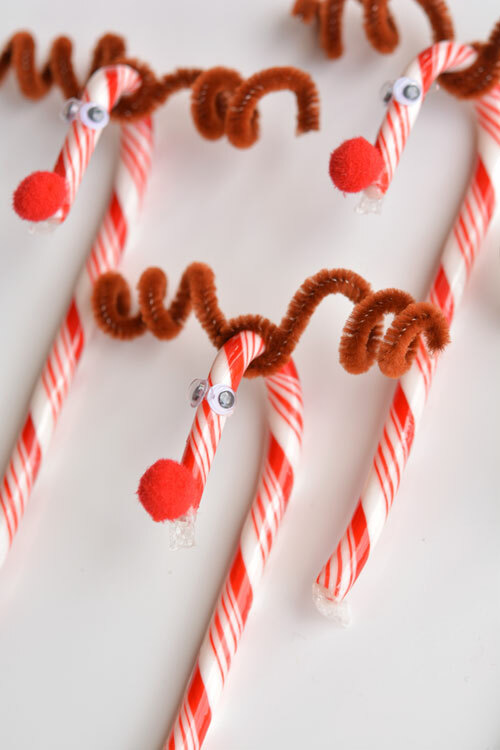 I haven’t seen these in ages and ages, and they are such a perfect craft to do with kids! 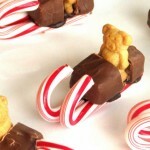 Maybe I’m just a big kid, but these were so much fun to make! I loved that my three year old helped me, and I love that these are pretty much fool proof! 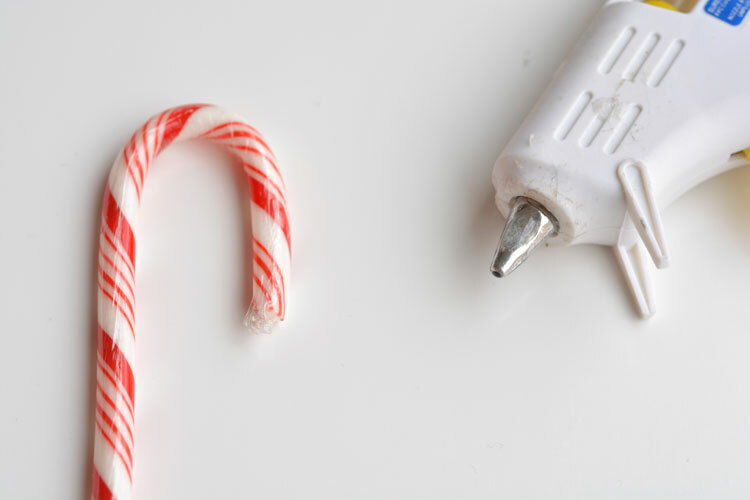 You’ll definitely want to pull out your trusty glue gun for this. I’m pretty sure nothing else is going to stick to the plastic. The glue gun was perfect though. 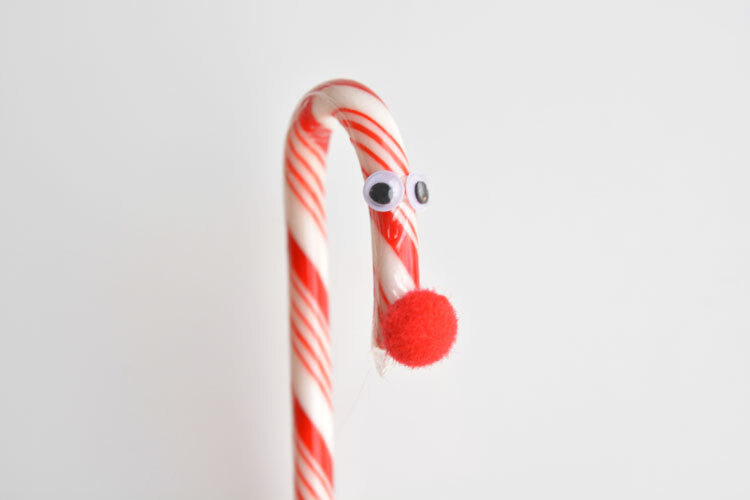 I placed one of the eyes badly and tried to rip it off and it ended up pulling off part of the candy cane plastic underneath it. So if you are worried about eyes and noses falling off, don’t be, because they’re not going anywhere. I tried a few different sizes of pom poms, but the small ones seemed to work the best. It was a toss up between these and the super mini ones, but the minis were just too small. I’ve seen these made both with tiny googly eyes and the size that I chose here. 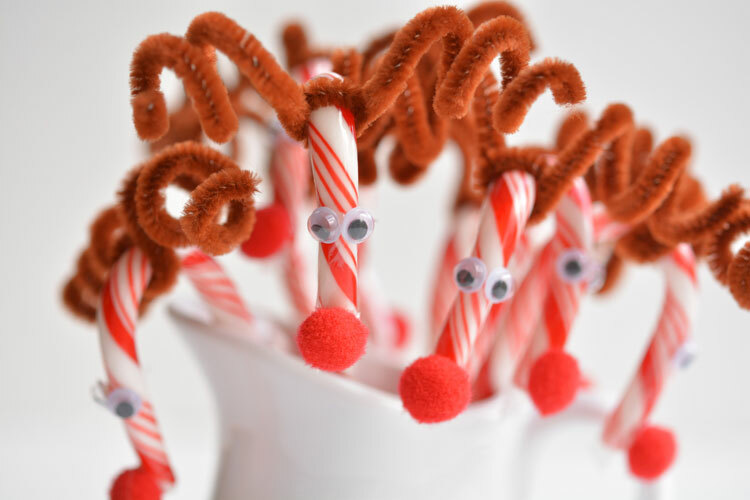 If you do a quick search on Pinterest, you’ll find lots of other examples of these candy cane reindeer with different sizes of eyes and differently shaped antlers… and some other cute ideas too! I tried out a few different antler shapes, but ultimately the spiral ones were the easiest, so that’s what I went with. 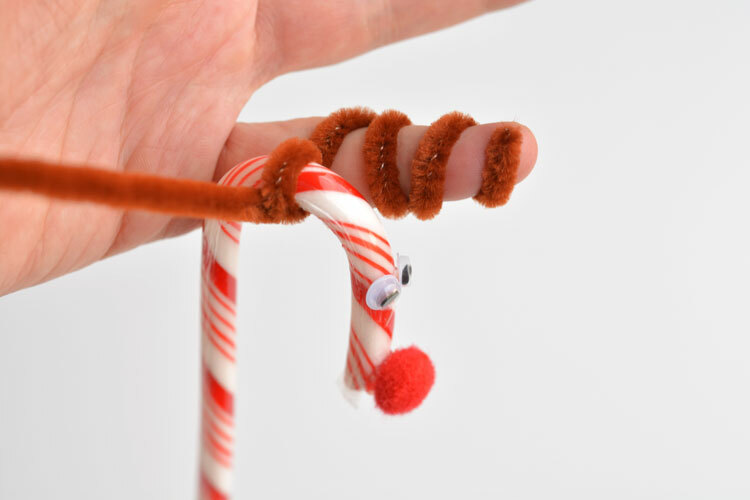 Wrap the pipe cleaner around your finger and then bend them into shape. I got to “borrow” my three year old’s finger to bend a bunch of the pipe cleaners. She was thrilled to help! She found the dollar store Santa hats that I bought for our Christmas card photo (Eek… I can’t believe it’s already time to start planning the Christmas card photo! 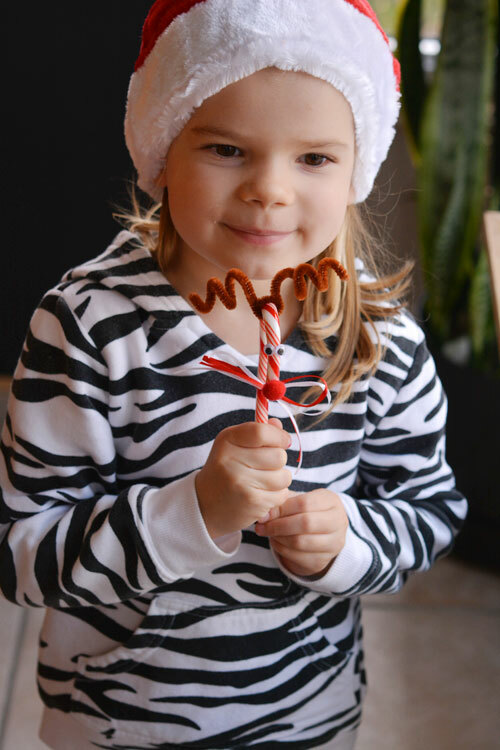 No candy canes, but they had Santa hats…). She couldn’t do any gluing since we were using the hot glue, but she loved passing me all the pom poms and googly eyes. Those googly eyes are a pain to pick up off the table! Plus, it was festive just having her around in her Santa hat. And then, just for fun, we finished them off with little red and white bows. I used 50 cent ribbon I picked up from Walmart. Not that it needed it, but it just added some extra cuteness! 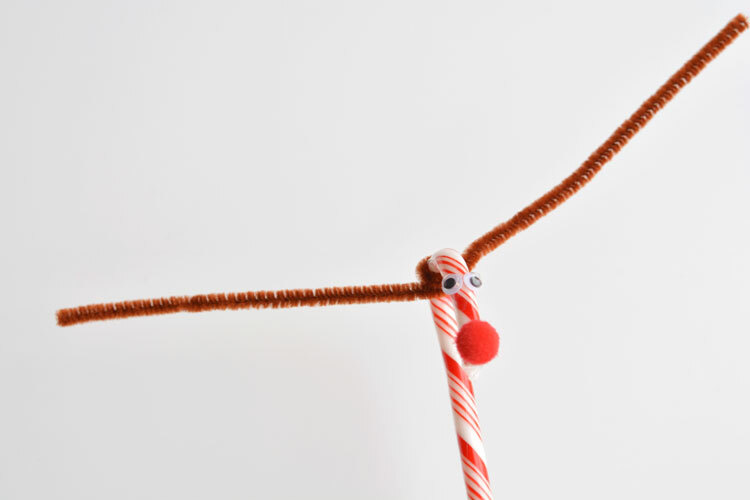 These guys are so fun, and so easy to make! They’d make great little Christmas ornaments for the tree! 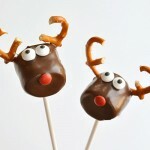 Or you can give them out as party favours or classroom gifts. 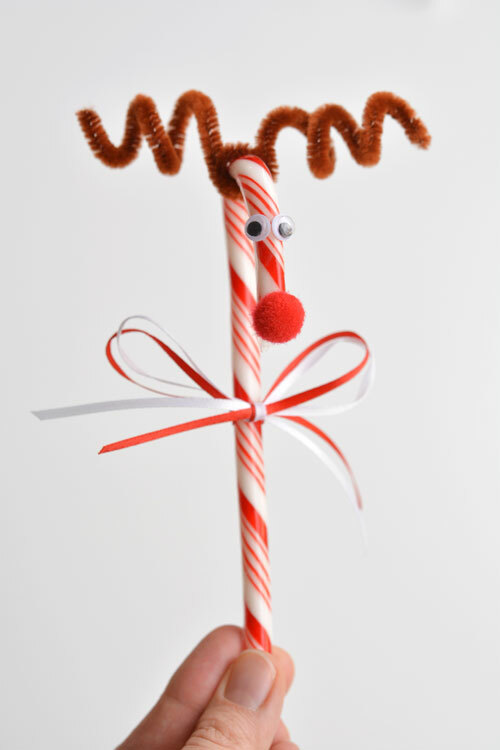 Or, if you’re like us, you can just do them as a fun craft with the kids. My five year old was at school when we made them this afternoon, and when she sees them, she’s going to be so sad she wasn’t here to help! 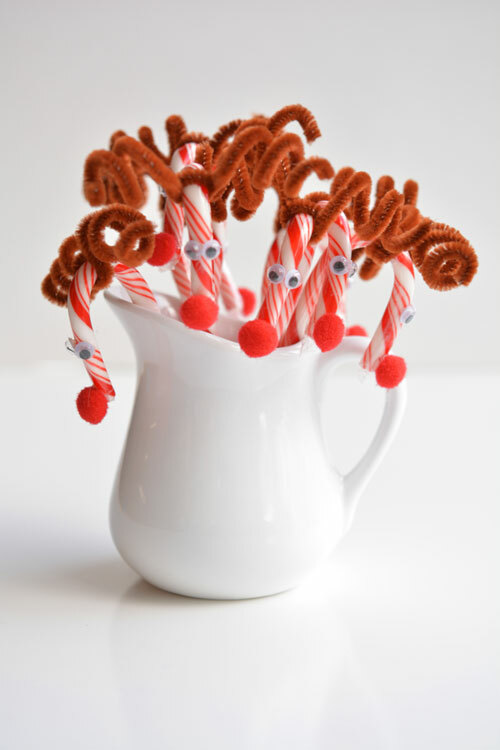 These candy cane reindeer are so easy to make! 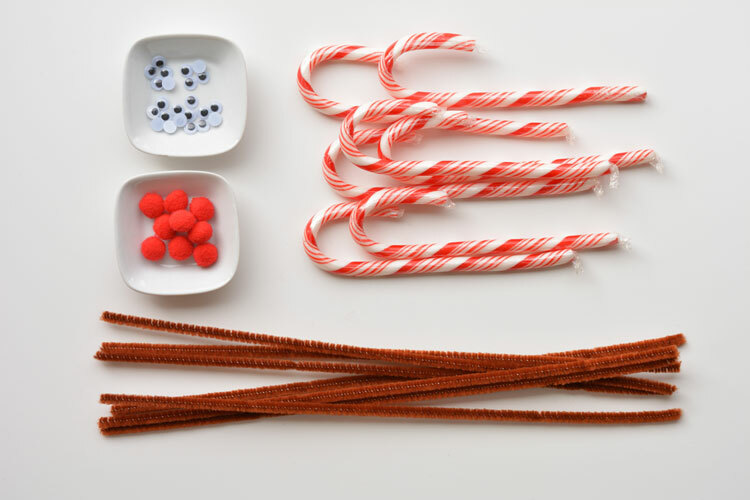 All you need are a simple craft materials and you’ll be all set! 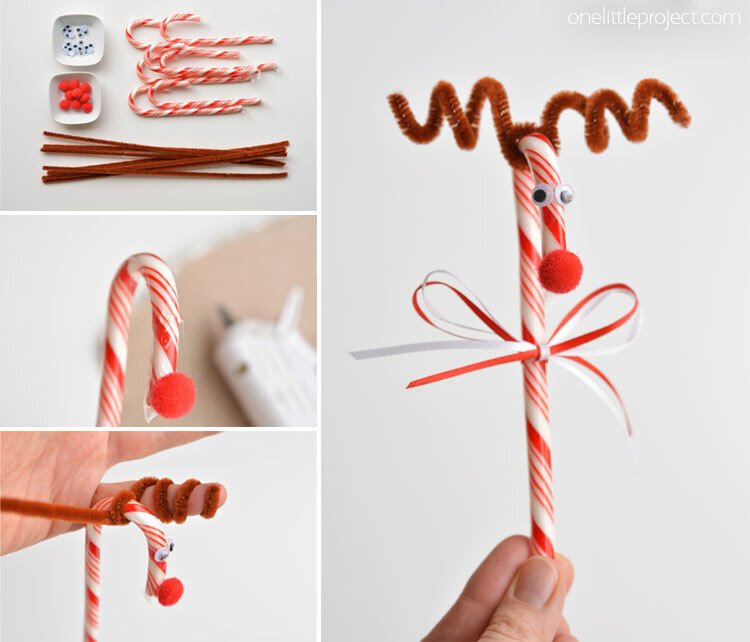 Make them for the Christmas tree, or as treats to send to school, or just as a fun craft with the kids. They’re really simple, and next to impossible to mess up! So cute! 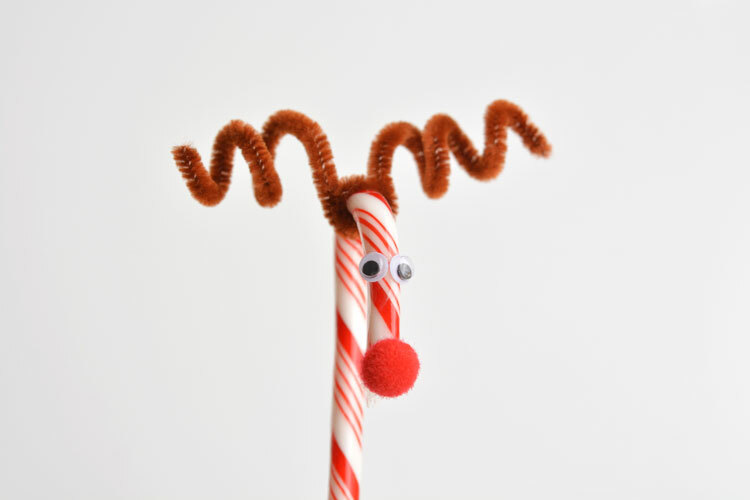 We do Christmas crafts with children who are guests at our hotel, The Inn at Christmas Place in Pigeon Forge, Tennessee. We might be able to do this with our kids. Thanks for posting! I have use glue dots also for this project, so little kids can design their own without a glue gun. Hello. 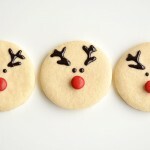 I think these are really cute!! I was wondering, what size are the googly eyes & the red pom-poms?